On July 24, the local judicial authority held a hearing regarding the case of Shanghai resident Zhou Zhenhua who had filed charges against the Shanghai East International Medical Center. The charges filed stated that the hospital had used Zhou's son, Yiqing, for a medical experiment in which a not yet fully tested and/or approved artificial heart was implanted in the boy. This unauthorized medical experiment on an unwitting patient has again brought international attention to the dark side of the Shanghai East International Medical Center (Medical Center). Several victims and doctors from the Medical Center have testified against president Liu Zhongming. The many testimonies charge that the hospital has used unwitting patients to conduct medical experiments. Many of the unwitting patients died because of the treatments they received while under hospital care. On April 16, 2004, Zhou Yiqing was hospitalized at the Shanghai Children's Hospital. Yiqing was diagnosed with idiopathic dilated cardiomyopathy. On April 22, the Shanghai Children's Hospital consulted with the Medical Center president Liu regarding treatment options for their patient. Yiqing underwent heart surgery that same evening. On July 15, 2005, the Medical Center again conducted surgery during which an artificial heart was implanted. The boy died on July 30. 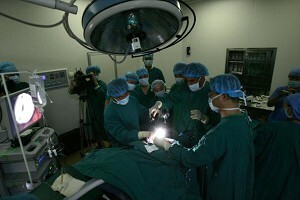 Yiqing's relatives said that the boy's chief surgeons were Liu and Weng Yuguo. The surgeons had used a type of artificial heart which had not been fully tested and/or approved as a medical product in China. Yiqing's relatives said the court hearing was very short. The plaintiff reiterated the charges and the court said it would hold another hearing in the near future. His relatives estimated that the trial itself will involve several such hearings. In the lawsuit, Zhou and his wife are suing the Medical Center for 990,694 yuan (about U.S. $120,000) in compensation for their son's unexpected death in the hospital. Yiqing's relatives have suggested that death in the hospital was murder. Their attorney had at one time filed criminal charges. The judicial department had refused to characterize Yiqing's unexpected death as a case of murder. His family and supporters suggests that the main reason for this is that the Medical Center has a very cozy relationship with the local judicial authority. Yiqing's family's only recourse was to file charges as a civil case in order for the court to accept and process it. “Huang Lin is the son of another victim,” said Chen Fengying. Chen was diagnosed with “coronary heart disease, menopausal syndrome” by the Medical Center early in 2003. But on March 26, 2003, Liu suddenly told Chen that her heart and lung were in very bad condition and were about to give out. She was told that without surgery, she would have only three months' to live. Liu told Chen that he was very experienced in heart and lung surgery and that the hospital would bear all the expenses for her surgery. During the next six months, Chen waited at Eastern Hospital for an organ donor. On September 21, 2003, Liu told her that an organ donor had been found in Zhenjiang City, Jiangsu Province. He provided a certificate for Chen stating “Recovered, therefore released from hospital.” In the interim, he transferred her to Zhenjiang Municipal People's Hospital. On September 25, Huang received a phone call from Zhenjiang Municipal People's Hospital telling him that his mother had died. Huang visited Chen's body at the morgue of Eastern Hospital. Her body was still plugged with tubing for oxygen, her abdomen was opened and her entire body was full of blood. Eastern Hospital claimed that his mother had died from an acute rejection reaction during organ transplant surgery. Huang and his father, Huang Rongkang contacted Eastern Hospital many times after Chen's death. They demanded Chen's medical records and organ matching certificate. The hospital refused to acknowledge their repeated requests for information. In July 2005, after much investigation into the case, Huang and his father began to suspect that their loved one had been used as an unwilling subject in a medical experiment. On September 5, 2005, Huang sued the Medical Center and Zhenjiang Municipal People's Hospital in Pudong New District People's Court. According to Huang's attorneys, all indications showed that Chen had been in good health prior to entering the hospital and should not have been diagnosed as a critical ill patient requiring organ transplants for both heart and lungs. Medical records approved by Liu were contradictory. Prior to becoming an attorney, Huang's counsel had been a cardiologist for 10 years. Pudong New District, Lu Jiazui Court has held three hearings on the Chen case. Huang and his attorney have filed a request for legal verification of his mother's physical condition prior to entering the hospital and the determination of whether or not she required a combined heart and lung transplant. To date, these tests have not been conducted. Huang said they had conducted many on-site investigations. They discovered that Eastern Hospital has often used ordinary patients, including children from orphanages, to conduct medical experiments. At least 10 cases similar to Chen's have been uncovered. The victim's families have formed a coalition to protect their rights and demand compensation for the unexpected death of their loved ones while under hospital care. An unidentified doctor from the Medical Center charged that Liu and other members of his staff had deliberately murdered many patients during medical experiments at the hospital. The victims include Xu Meidi, Xu Xiaopeing, Mr. Deng, Mr. Zhu and Mr. Ni. This unidentified doctor also noted that Liu is seeking revenge against his colleague, Dr. Tang. Dr. Tang was one of the first to expose Liu's use of hospital patients for medical experiments.